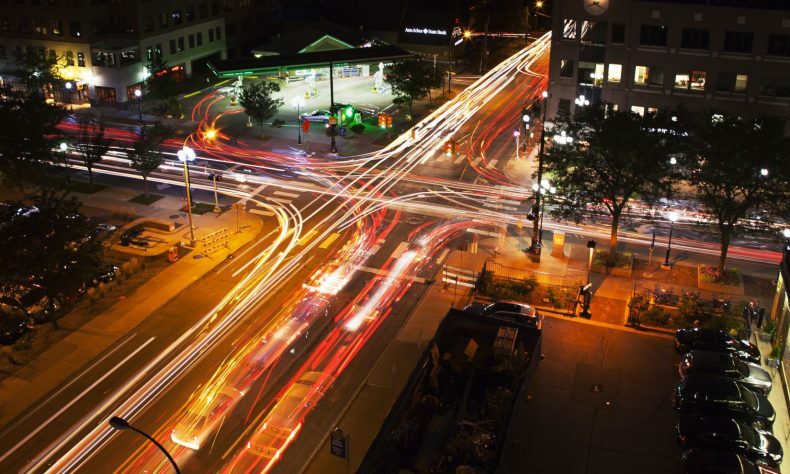 ANN ARBOR — Connected cruise control uses vehicle-to-vehicle communication to let automated vehicles respond to multiple cars at a time in an effort to save energy and improve safety. Vehicle-to-vehicle communication, or V2V, refers to the ability of cars to wirelessly share data including their speed and position in real time. Connected cruise control can adjust a vehicle’s speed based on information obtained through V2V. It’s different from adaptive cruise control in that it tracks more vehicles than just the car in front of it. The tests on public roads have shown how connected cruise control and V2V between automated and conventional cars performs in a common traffic scenario — a chain-reaction braking and re-accelerating caused by one car at the head of several others. An automated vehicle utilizing connected cruise control was able to brake with 60 percent less of the G-force required by a car with a human driver. “Automated cars utilizing V2V data will not only perform better, but they can also foster a friendlier environment where few safety hazards sneak into traffic and higher efficiency is possible for all cars on the road,” said Gabor Orosz, a UM associate professor of mechanical engineering who led the research. Automated cars are coming, but they will face many challenges when sharing the roads with human-driven vehicles. On-board sensors cannot see around corners or see through buses and trucks. If a car suddenly appears within the sensors’ view, the automated car has little time to respond and may need to brake hard to avoid a potential collision — just like a human driver. “A significant amount of cars on the road will be equipped with V2V communication devices during the next few years, since major automakers such as General Motors, Volkswagen and Toyota are deploying such communication devices on their new cars,” Orosz said. In the experiments, Orosz’s group recorded scenarios where braking got increasingly more severe while cascading along a chain of human-driven vehicles. When the speed decreased from 55 mph to almost zero and then reached 55 again, some humans decelerated heavily up to 0.8 G, sending anything not buckled down flying towards the windshield. However, the V2V-based automated driving algorithm maintained a steadier speed profile, gliding through the ripples of rapidly changing traffic. The deceleration of the automated vehicle was kept less than 0.3 G, not spilling a drop from a full cup of coffee. Safety and comfort are not the only benefits an automated car can harvest from V2V information from nearby human-driven cars. Orosz’s group also found that the V2V-based automated driving algorithm can save energy in stop-and-go traffic compared to traditional sensor-based algorithms. After all, more steady speed means less energy wasted in braking and higher mileage for a gallon of fuel or a pack of battery. And even human-driven cars following the automated vehicle can save up to 7 percent energy, thanks to the smoother speed profile. The study is titled, “Experimental validation of connected automated vehicle design among human-driven vehicles.” The research was funded by Mcity, a UM-led public-private partnership working to accelerate advanced mobility vehicles and technologies.